IDS Group | IDS Ingegneria Dei Sistemi S.p.A. The IDS group has grown from a single company founded in 1980 to the present 12. This growth includes the formation of a number of subsidiaries in key locations around the world that enable IDS to be closer and more accessible to its international clients. With a knowledge of local business customs and languages, and the advantage of being in a similar time zone, they are able to provide faster, more appropriate responses to our clients’ needs. IDS has recently purchased a number of companies who have a high level of expertise in niche areas such as unmanned systems, satellite communications and systems management software. These companies complement the IDS group’s capabilities, provide specialist knowledge in their fields, and enable IDS to offer a fuller range of solutions to our clients. In addition, IDS has entered into a couple of joint ventures in order to develop specific solutions using the specialized capabilities of their parent companies. These consist of radar based railway safety systems and a modular building panel system that can provide protection against a range of threats including fire, ballistic weapons and explosive blasts. 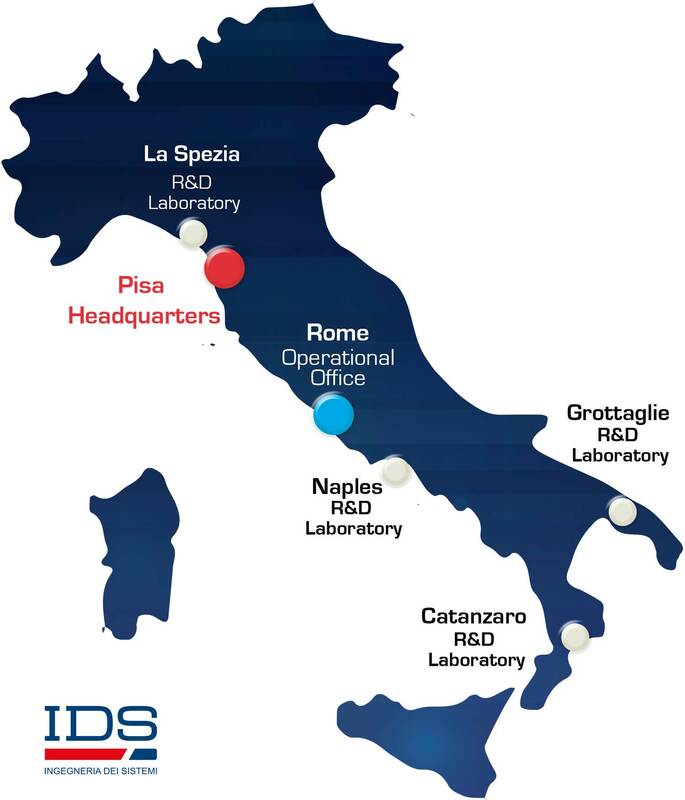 Finally, IDS has added a number of offices and laboratories in Italy to its headquarters in Pisa. The largest of these offices is in Rome, which is the home of the Air Navigation division and houses the division’s show-room/operational test-room. These additional offices bring IDS closer to key clients in Italy and also help us recruit the best, most qualified staff. ROB.INT was formed following the purchase of part of Celin Avio and is tasked with developing ground and underwater unmanned systems, from the initial prototypes through to full solutions. It also provides support to the Aeronautical and Unmanned Systems Division, offering its technical expertise as well as hardware and software. STARS Railway Systems is a consortium that has been formed by IDS and Intecs that was founded to develop and manufacture radar based safety systems for railways. Currently this includes Sirio-LX which is an automatic system to prevent trains from colliding with obstacles on the track at level crossings and Sirio-OD for the automatic detection of objects which have fallen on to railway tracks in high-risk zones such as near overpasses, tunnels and areas prone to landslides. Skytech-Italia is a t the forefront of satellite communications technology, providing a range of fixed and mobile multiband satellite communications terminals using the highest technological standards and innovative transmission methods to provide services such as high speed, high bandwidth internet connections ideal for video communications as well as high speed, high security data links. TRS is a systems and software house specializing in space applications, for which it is qualified to develop software for various international space programs, railway software systems for train management, command and control systems for various applications including homeland security, naval C&C and airport vehicle fleet management. It also develops monitoring systems and sensor networks which can be used for such applications as the Internet of Things and Smart Cities. Pelta Protection Systems is a joint venture between IDS and Acell Industries Ltd. It develops solutions based on the Defender panel, a building panel with a special internal foam that provides fire resistance, and thermal and acoustic insulation. These panels can be modified to also provide blast and ballistic protection as well as antibacterial and electromagnetic properties. The same materials can also be used to create protective barriers, shelters and living quarters. The IDS headquarters are based in Pisa, the home of the famous leaning tower, and are near Pisa’s international airport, the main airport in the region of Tuscany. The Pisa office is the largest IDS office, with around 350 staff, and is the location of most of IDS’s divisions and laboratories, including the IDS’s impressive electromagnetic measurement laboratory. Rome is home to IDS’s second largest office, with a staff of around 100 people, and is the location of IDS’s Air Navigation Division which develops and supports IDS’s solutions and services for air traffic management and airports. It is also the location of one of IDS’s ICAO recognized flight procedure design centers. IDS Korea is based in Daejeon, South Korea, where it provides support and services to local clients in the Korean market. The IDS Naples laboratory develops firmware as well as processing software for the company’s radar systems. Catanzaro is located in Calabria in the toe of Italy and is the home of an IDS laboratory which performs research and development into the potential uses of smart materials. This includes the research of the use of radar shielding materials and frequency selective surfaces as well as materials for absorbing unwanted signals from Instrument Landing Systems (ILS). The La Spezia office in Liguria, relatively near to the Pisa headquarters, performs research and development into naval applications. One of its primary activities currently is the research of the integration of sensors on the masts for naval vessels.